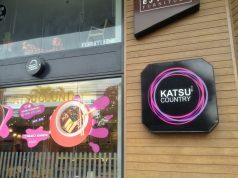 The Historic Kapampangan Sisig Found a New Home! 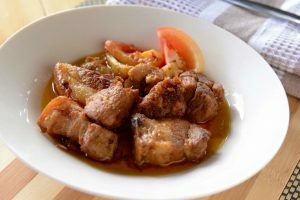 Talking about authentic dishes, you can be sure Pampanga recipes will top the list. 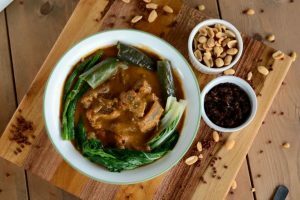 This province in Central Luzon is known for its culinary works. 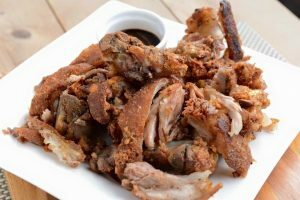 From famous food products such as Tocino, Beef Tapa, Hotdogs and Longganisa to specialty food like Lechon, Lechon Kawali and ultimately the Pork Sisig. In fact, back in 1974, it was acknowledged as “Sisig Capital of the Philippines” by the Department of Tourism. 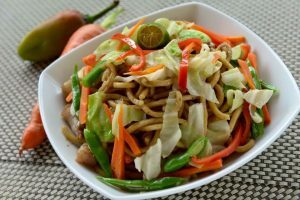 Sisig is defined as “salad” in Spanish which means combining some fruits and vegetables with salt, pepper and vinegar. 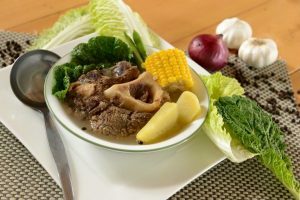 In the Philippines particularly in Pampanga, local chefs have reinvented the dish by using Pig’s Head, Ears and Liver boiling, grilling and making it crispier by serving it on a sizzling plate. 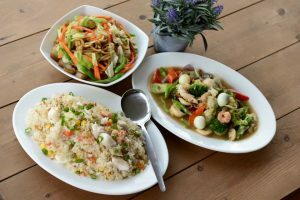 Others have experimented ingredients such as Chicken, Squid and Tuna. 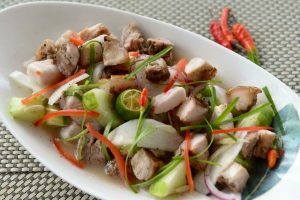 In Angeles City an “Annual Sisig Festival” is held every year to celebrate the famous filipino dishes, primarily sisig to features recipes from local chefs and restaurants. 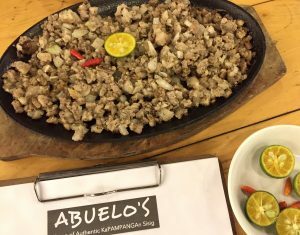 You don’t have to go to Pampanga to get a taste of this famous dish, as “Abuelo‘s Home of Authentic of KaPAMPANGAn Sisig” brought the recipe in Davao. 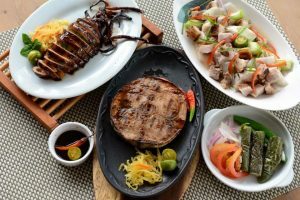 With 2 branches in the city, located in Marfori and Damosa, they offer an authentic recipe of Sisig (Main Dish) shying away from egg and mayonnaise (evident in most sisig recipes) and focused on its original ingredients, one of which is Liver. 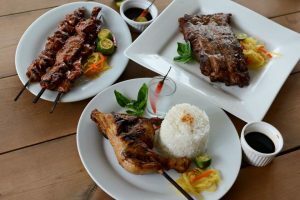 The place has a Grill atmosphere designed for all types of customers looking for daily Filipino Food. 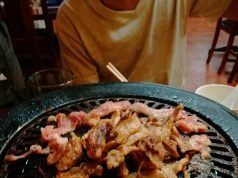 Last October 28, Abuelo’s Marfori has celebrated it’s “1st Birthday” by giving away free Sisig for the first 38 customers dining on that day (Buy 1 Take 1). 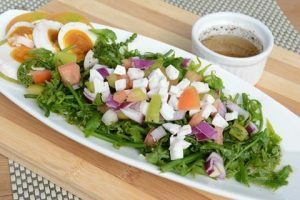 We got a chance to interview Abuelo’s co-owners TJ Aviles and Pedro Lorenzada about this great place. We found out that Pedro’s wife is from San Fernando, Pampanga and the word authentic became clear. We asked them how they manage the place and their employees. They shared to us that having a relax culture, making sure everyone is happy are the most important part of their management. 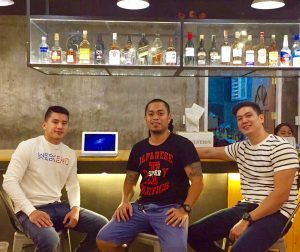 When asked about their business plan for future, they told us their goal of bringing the recipe not only in Davao but other cities in the Philippines as well. 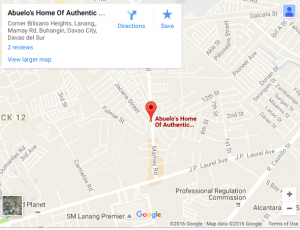 Abuelo’s in Davao is truly the Home of Authentic KaPAMPANGAn Sisig.